Working people’s wages and conditions, safety, job security, living standards, and democratic rights have been under immense attack for decades. We need to restore collective bargaining, penalty rates, union rights of entry, abolish the ABCC, raise wages, eliminate insecure jobs, gain the right to strike…the list goes on. In short, we need to Change The Rules! But how? Australia is owned and run by giant tax dodging foreign multinationals and local big businesses. They set the political and economic agenda in this country through peak business bodies like the Business Council of Australia (BCA) and Australian Mines and Metals Association (AMMA). Politicians are just the talking puppets who represent their interests and turn their agendas into law. And they demand their agenda be implemented regardless of which party forms government. There will be a federal election in May. To realistically change the industrial relations legislation in Australia in the current conditions requires the removal of the Liberal Party from government. In a two-party system that means the election of the ALP. There is no problem of recognising this as a first step in a broader strategy. But we should not hold any hope or illusions that the ALP will fix our problems for us. No matter what promises they make! Because if elected, the ALP will be subjected to the same pressures and demands to administer the profit driven and anti-worker capitalist system in the interests of the ruling class - the foreign multinationals and big businesses. That’s why serious change can never come from the ballot box. 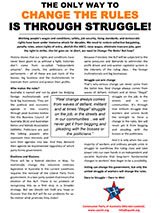 Real change always comes from waves of defiant, militant and at times “illegal” struggle on the job, in the streets and in our communities. It’s through that militant struggle that workers and unions build the strength to force a change in the rules. We will never get it from begging and pleading with the bosses or the politicians. And it is only when the vast majority of workers and ordinary people unite in struggle to overthrow the ruling class and take power into our own hands in an independent and socialist Australia that long-term fundamental changes to workers’ lives begin to be a possibility. Voting can change the government, but only the united struggle of workers will change the rules. Dare to Struggle - Dare to Win!